A scholastic chess tournament is a competition in which young chess players like you indulge in their favorite activity. 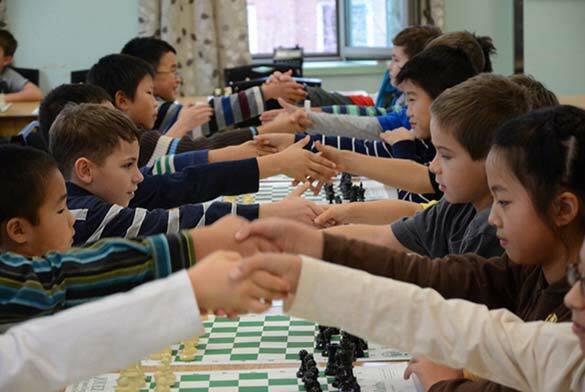 The Chess’n Math Association, a leader in organizing scholastic chess tournaments, has exciting tournaments for beginners to advanced players. If you know how to checkmate, you are good enough to play in a tournament! Why play in a tournament? Practice your favorite activity with other chess enthusiasts like yourself. It is recognized that practicing in a healthy competitive environment is the key to success in any discipline. We suggest 10% theory and 90% practice. There are many players in a tournament and playing against different players is important. A rating is a numerical evaluation of a player’s skill (see The Scholastic Rating). Higher is the rating, better is the player. The rating increases or decreases depending on your performance in rated tournaments. All tournaments run by the Chess’n Math Association are rated. The game of chess is a gentleman’s game. During a tournament we learn the rules of good sportsmanship and fair play without even being aware of it! Did you know that young people who participate in competitive sports have better grades? They are more disciplined, more determined and have more perseverance. Wow, all this just from practicing your favorite activity! So, when’s the next tournament? Our calendar of activities includes different types of scholastic chess tournaments and caters (with some exceptions) to students from kindergarten to Grade 12. The information below applies to tournaments organized by the Chess’n Math Association in the Montreal, Ottawa and Toronto areas (unless otherwise indicated).